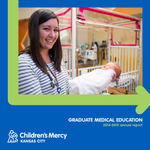 Children's Mercy Hospital, "Graduate Medical Education 2014-2015 Annual Report" (2015). GME Annual Reports. 6.